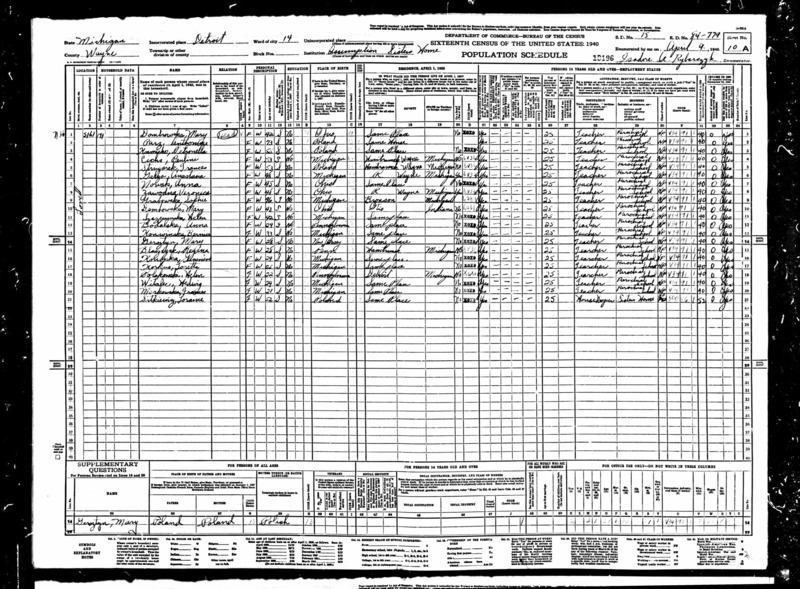 Here are the names of the Felician Sisters that were assigned to the parish of Assumption of the Blessed Virgin Mary in Detroit, Michigan at the time of the 1940 U.S. Census. Mary Dombrowska (Head), age 42, born in Ohio. Anthonina Parz, age 73, born in Poland. Petronella Kosmecko, age 55, born in Poland. Pauline Cichs, age 53, born in Michigan. Frances Strugarek, age 53, born in Poland. Anastasia Gatza, age 48, born in Michigan. Anna Nowak, age 45, born in Ohio. Veronica Zawodna, age 48, born in Ohio. Sophie Grabowska, age 46, born in Michigan. Mary Dembowska, age 43, born in Ohio. Helen Szczepanska, age 42, born in Michigan. Anna Bodalska, age 29, born in Pennsylvania. Bernice Konwinska, age 33, born in Michigan. Mary Gersztyn, age 28, born in New Jersey. Regina Blaszczak, age 28, born in Pennsylvania. Genevieve Konopka, age 24, born in Michigan. 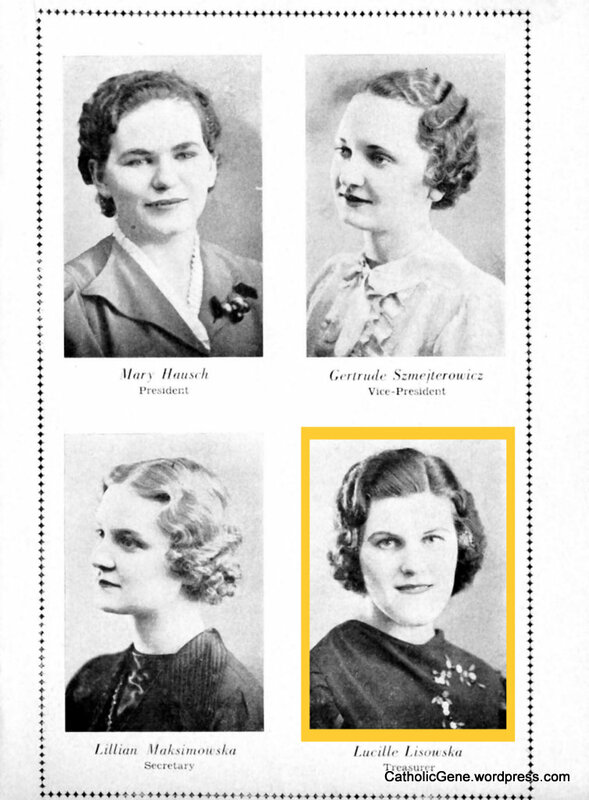 Loretta Korkus, age 25, born in Michigan. Helen Polakowski, age 22, Pennsylvania. Hedwig Witalec, age 24, born in Michigan. Frances Markowska, age 21, born in Michigan. Loraine Sitkiewicz, age 52, born in Poland. I want their names to get out there, appearing in search engines across the Internet. It’s been my experience that nuns were often the forgot lot among those who chose a religious life. 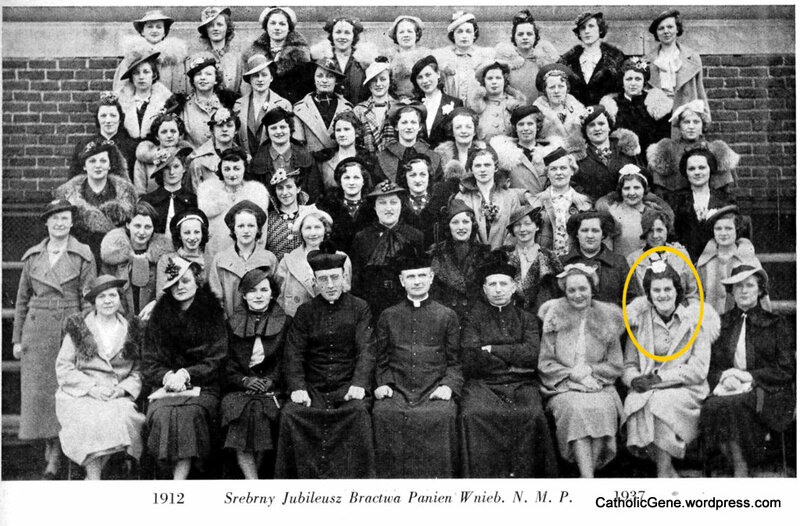 When I look back on the 25th and 50th Jubilee books for Assumption parish (published in 1937 and 1962 respectively), I find that the priests had full page portrait photos with their names as captions (not just the current priests but the previous as well) but the nuns had no photos or names at all in the 25th Jubilee book and only photos with the children in their classrooms in the 50th Jubilee book. Their names were not included. It’s almost as if they took vows of not only poverty and chastity but of invisibility as well. I find that very sad as they worked every bit as hard as the priests. Yet little mention of them was made in commemorative publications. 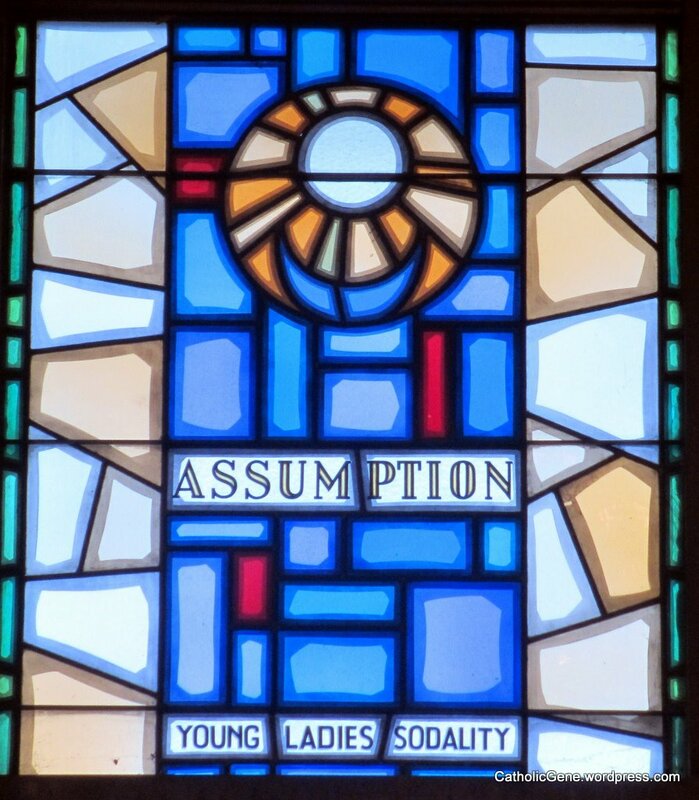 I wish these circumstances were only true for Assumption parish, but sadly that’s not the case. I have 14 parish jubilee books and the lack of photos/names of the good sisters from those parishes is all too common. They just never seem to have gotten the billing that the priests, the choir, the Rosary Society members, those making their first Holy Communion, the Holy Name Society, the Altar Boys, etc. got. So I’m glad to see their names in the 1940 U.S. Census and I’m happy to extract those names here for their family members to find. Today, Monday, April 23rd, is the feast of St. Wojciech/Adalbert, who is revered as one of Poland’s oldest saints and in fact one of the great patron saints of the Polish nation. He is a saint also of great importance to us, Polish-Americans of the Archdiocese of Detroit, because the very first Polish parish in the city of Detroit was placed from its very beginning under the protections and patronage of St. Wojciech. Wojciech was born of a noble family in Bohemia in 956, ten ears before Poland became a Christian nation with the baptism of King Mieszko the first bishop of Magdeburg. It should also be noted that Adalbert and Wojciech are two different names, not the Latin and Polish equivalents of the same name! The name Wojciech in Slavonic means “Help of the army.” The English name of Detroit’s first Polish parish “Albertus” was the name mistakenly given to the church at the time of its dedication. Albertus is the Latin form of Abert. This mistake was never corrected in the 117 year history of the parish, which closed in 1989. As a child, Wojciech was consecrated to the Blessed Virgin by his parents who feared losing him to sickness. They promised the Virgin that Wojciech would live under her patronage with the clergy. Wojciech received an excellent education at the cathedral school of Magdeburg. In 982 he was ordained a subdeacon by the bishop of Prague. Though only 27 years of age, he was elected bishop of Prague in 983, after the sudden death of the previous bishop. Wojciech entered the city of Prague barefoot as a symbol of his humility. He was received with enthusiasm by Boleslaus II, prince of Bohemia, and all the people of that city. He proceeded to reorganize the diocese but was saddened to learn of the religious state of his flock. Most were Christian in name only. He withdrew to Rome in 990 but returned to Prague in 994 at the insistence of Pope John XV. Again he encountered difficulties and a refusal to accept the true gospel in Prague, which caused him to withdraw from Prague to Rome. Once again the Pope, Gregory V at this time, ordered him back to Prague. The people of Prague, however, refused to admit Wojciech to the diocese and so he turned his attention to the conversion of Poland (Pomerania) to Christianity as a missionary. He made converts at Gdansk but later met with scorn as he and his companions were accused of being spies. On April 23rd, 997, he and his companions were martyred near Krolewiec by being beaten to death with oars. After severing his head and fixing it on a pole which was carried throughout the village, his body was thrown into the Nogat River, a tributary of the Wistula, and washed up on the Polish coast. The body was held for ransom by heathens who received a small fortune, the weight of the body in gold, from Boleslaus, Duke of Poland, for its return. Later in 998 his body was enshrined in Gniezno; some of his relics, however, were returned by force to Prague in 1039. Adalbert was canonized a saint in the year 1000. When St. Albertus parish was organized by the St. Stanislaus Kostka Society (a group of Polish immigrants attending the nearby German St. Joseph Church) they chose the Bohemian born St. Adalbert/Wojciech as their patron. The date of the meeting of organization of the new parish was April 23rd, 1870, the feast of St. Wojciech. He was a fitting choice for patron as many of the early parishioners of the Church had come from that area of Poland known as Pomerania and Poznania where St. Wojciech had ministered. They were known as Kaszubs and spoke a dialect of Polish heavily influenced by the German language. Wojciech was the first great adopted patron of the Christian Polish nation. He had been venerated for over eight centuries as Protector of the Poles when he was selected to be the patron of Detroit’s first Polish parish which was primarily composed of Kaszubs. When the first St. Albertus Church was dedicated on Sunday, July14th, 1872, the name of the patron was inadequately translated from the Latin Adalbertus to the English Albertus, thus forever identifying Detroit’s first Polish parish by the misnomer Albertus. Such is life! For better or worse, the Mother Church of the Detroit Polonia is known, at least in English, as St. Albertus. I have several family ties to St Wojciech and his feast day. I am Polish and he was the first patron saint of Poland. My great grandparents, Szymon and Ludwika Lipa were members of St. Albertus parish in Detroit when they first immigrated to the U.S. Some of my grandaunts and uncles were baptized and buried from that parish as well. Although I was never a member of that parish myself, I created a website for the parish and served as webmaster for several years. I have numerous Granduncles and a couple grandfathers named for St Wojciech. My mother, who always held her Polish heritage near and dear to her heart, died on this day in 2007. I had intended to write about St. Wojciech in honor of his feast day today but when I read the very nice article Fr. Borkowski had written I knew I could do no better. There has been a Catholic presence in the city of Detroit since the parish of Ste Anne was founded in 1701. The city was first made a part of the Diocese of Bardstown, Kentucky in 1808 and then it became a part of the Diocese of Cincinnati in 1821. Pope Leo XII named Detroit as a diocese in 1827 but for some reason his proclamation was not implemented. Once again, in 1833, Detroit was made a diocese with Father Frederick Rese as it’s first bishop and Ste Anne as it’s first cathedral. March 8, 1833, was the official date that the Diocese of Detroit was founded. That was 179 years ago today. The territory of that initial diocese included all of Michigan, Wisconsin, Minnesota, and the Dakotas east of the Mississippi River. When Michigan officially became a state in 1837, the boundaries of the diocese were realigned to match the state boundaries. As of 1841, the Diocese of Detroit had 18 priests, 30 churches, and some 24,000 Catholics. The population continued to grow and many new churches sprang up around the state. The densest population center continued to be the city of Detroit. In 1853 the upper peninsula became a vicariate. 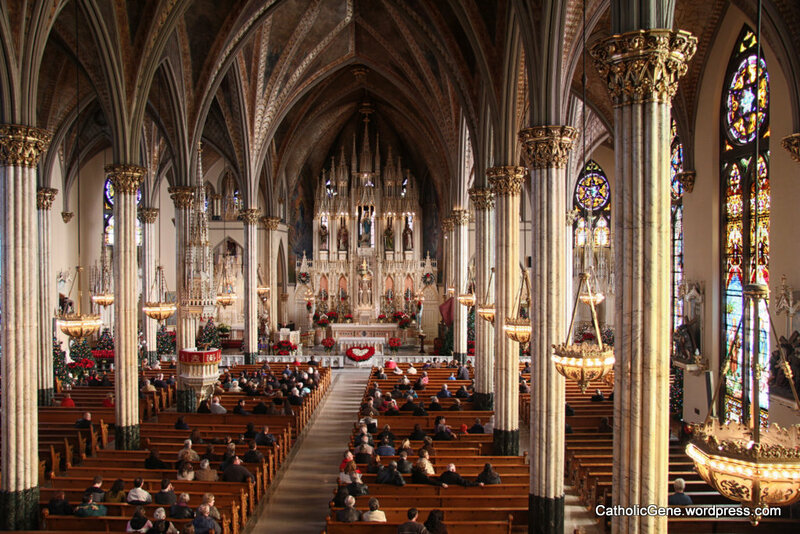 By 1870, the Diocese of Detroit had 88 priests, 80 churches, and 150,000 Catholics. The following year, in 1871, Detroit’s Polish immigrants petitioned Bishop Borgess for a church of their own. Permission was granted and the first Polish Catholic church, St Albertus, was founded in the area known as “Poletown”. When my great grandparents, Szymon and Ludwika Lipa, first arrived in the U.S. from Poland (1881) they became members of St Albertus parish. Their first American-born child, Stanislaw, who was born on March 8, 1882 – 49 years to the day after the founding of the Diocese of Detroit, was baptized there. As more and more Polish immigrants came to Detroit they settled primarily in two different areas of the city, one on the east side, Poletown, and one on the west side. It didn’t take long before the Poles living on the west side wanted a church of their own so as not to have to travel all across the city to hear Mass said in their native language. 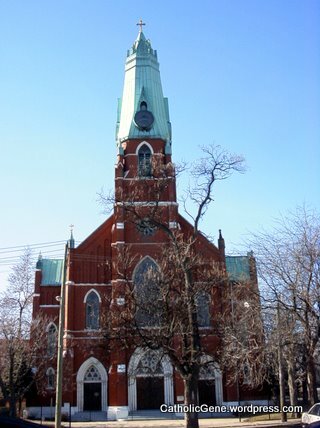 In 1882 the second Polish Catholic church in Detroit was founded. That was St Casimir. The communities of Polish immigrants continued to grow and flourish and the third and fourth Polish parishes were founded in 1886, Sweetest Heart of Mary (east side) and St Francis D’Assisi (west side). A fifth Polish parish was founded shortly thereafter in 1889, St Josaphat (east side). The entire Diocese of Detroit was growing as immigrants continued to flood the city. The population swelled and so did the churches. My maternal grandparents arrived here in 1912 and 1913. Many more Polish Catholic churches were founded in the years just before and well into the new century. Some of the parishes my family were members of included Sweetest Heart of Mary (1886), St Francies D’ Assisi (1886), St Josaphat (1889), St Hedwig (1903), St Hyacinth (1907), Assumption BVM (1911), St Andrew (1920), and Sts Peter and Paul (1923). On May 22, 1937 Detroit was elevated to an Archdiocese and Edward Francis Mooney was named as the first Archbishop. At that point the Archdiocese had more than 800 priests, 345 parishes, serving 602,000 Catholics. This would later become known as the “Golden Era” for the Archdiocese of Detroit, when the pews were packed to the point of standing room only for many Masses. That same year the makeup of the Archdiocese was changed as Lansing became a diocese and Grand Rapids and Marquette were made suffragan dioceses. The following year, in 1938, the Diocese of Saginaw was formed. It was in the 1940s, during WWII, that the first expressways were built in Detroit. More followed in the 1950s. Those major thoroughfares cut through many parish neighborhoods as they were being constructed. Some historians point to those first expressways as the beginning of the decline of some of the Catholic parishes in the city of Detroit. As homes were bought up to make way for the expressways, people were displaced and often moved farther out from the city. For the most part, the Catholic churches in the city proper still flourished during the 1950s and 1960s but more and more people were moving to the suburbs and new churches were being built there to accommodate the population shift. In 1967 there were serious race riots in the city and that seems to have been a real turning point. Many Catholics fled to the suburbs because they no longer felt safe in their Detroit neighborhoods. They sold their homes in the city to African Americans who usually weren’t Catholic. That movement became known as “white flight”. The Archdiocese of Detroit shrunk even more in 1971 when the Dioceses of Kalamazoo and Gaylord were created. A handful of Catholic parishes in the Archdiocese of Detroit were closed or merged during the 1960s and 70s but by the end of the 1980s it became clear that more needed to be done to deal with the population shift. In 1989, thirty-one parishes were closed by Cardinal Szoka. Among those 31 parishes were St Albertus, the first Polish parish, St Casimir, and Assumption BVM which members of my family belonged to. Another 40+ parishes were closed or merged since the year 2000. And sadly, even more will have to be closed or merged this year. As of 2009, the most recent year I can find statistics for, there were 271 viable parishes in the Archdiocese, 60 of them were located within Detroit, Hamtramck, and Highland Park, 195 were suburban parishes, and 18 were considered to be in rural areas. The Archdiocese of Detroit now consists of six counties, Lapeer, Macomb, Monroe, Oakland, St Clair, and Wayne. Many, many of my extended family members still live within the boundaries of the Archdiocese of Detroit. On this day, the 8th of March, I celebrate the 179th anniversary of the founding of the Archdiocese of Detroit and the 130th birthday of my Granduncle, Stanislaw Lipa. It’s no secret that there’s a shortage of Catholic priests here in the United States. Virtually all dioceses and archdioceses are scrambling to figure out how to cope with the situation. In the Archdiocese of Detroit they have been working on constructing a plan for the future since 2004. Representatives from each parish have been a part of the planning process. A few weeks ago, the proposed plan that the representatives came up with was made public. That plan would have 9 parishes close and another 60 merge into 21. These are pretty drastic but unfortunately necessary changes. They aren’t the first parish closings in the Archdiocese of Detroit and likely won’t be the last. At some point in February 2012, Archbishop Allen Vigneron will announce which of these changes, recommended by parish representatives, will need to be implemented. It is expected that the plans approved by the Archbishop will be implemented immediately and completed by June 2012. 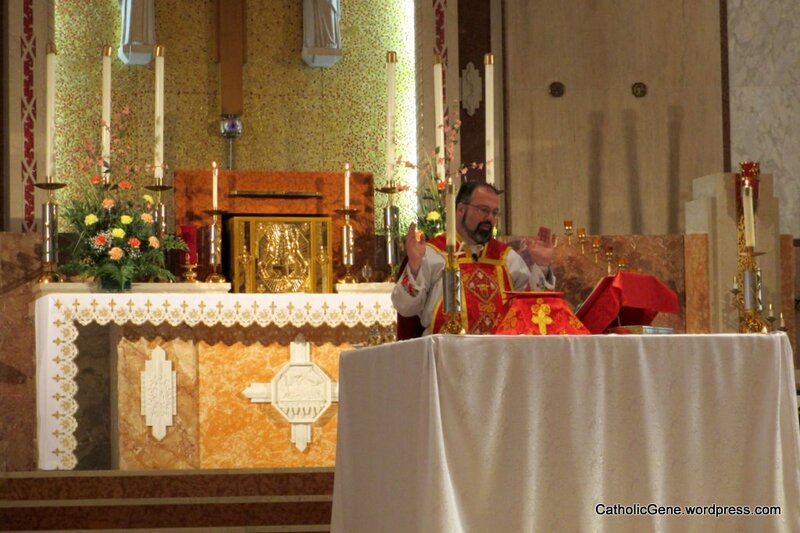 As you can imagine, it’s made for some anxious times for many metro-Detroit Catholics. Nobody wants to see their beloved church and Catholic community closed or merged. Everyone is hoping their parish will be spared. But at the same time we know that can’t be. As a Catholic, I understand how difficult it can be to let go of one church and begin worshiping at another. Over the years you develop friendships and allegiances with neighbors and church staff that are difficult to replace at a new parish. You’ve established routines over the years and there’s comfort in the familiarity of knowing what to expect in your parish throughout the liturgical year. It’s even more difficult for the Catholic genealogist and family historian. Parish records get relocated. Family histories that are tied to a given parish for several generations must end. Traditions that are tied to the church will come to an end as well. A Catholic church and the Catholic faith are ties that bind many families over generations. These are institutions that are held as sacred. Respected. Honored. It’s difficult to imagine life without them. The houses my grandparents and great grandparents lived in after they immigrated from Poland to Detroit are all gone now. One by one they were razed as a result of urban blight and urban renewal. Of the 6 Detroit churches my ancestors had strong family ties with, 1 parish was closed and the building razed and 1 parish was closed but the building remains. The other 4 churches are still standing and have active parishes but few registered parishioners. Who knows how much longer that will be the case? They are in neighborhoods that have few houses left standing and they rely heavily on people coming in from the suburbs to attend Mass. I suspect a couple of these churches will be closed. That makes me very sad. I can’t revisit my grandparent’s houses. With those buildings no longer existing I’ve relied on visiting their parish churches to connect with them. Whenever I attend Mass at one of those beautiful old churches I can’t help but think of them. I run my hand along the back of the pew during Mass and wonder if they sat in that same space and touched that same pew. I go to Mass and walk down the same aisle they walked down for communion more than 120 years ago. I make my confession in the same confessional they did and wonder about what sins they may have confessed when it was their turn to talk to the priest. I gaze at the same stained glass windows I know they gazed at when the beautiful morning sun came streaming through and set the colors ablaze. And I wonder about the glory of God the same way I know they must have. When I attend my local suburban church I don’t have those same connections. Even though I’ve attended there with my immediate family for years, the type of connection I feel is not the same. It’s not that deep familial connection with the past. I would hate to see it close but I wouldn’t miss it like I would miss the old churches of my ancestors. What about you? Have you visited the churches where your ancestors worshiped? Are they even still standing? Perhaps it’s not too late for you. Whether you live in metro Detroit where church closings are imminent or another area of the country, you may lose the opportunity to do so soon if you haven’t already. The shortage of priests isn’t going away soon. More church closings are probably coming to a diocese near you. Take the opportunity now to visit the churches of your ancestors. You’ll be glad you did.